John Updike’s children—Elizabeth, David, Michael, and Miranda—have been supportive of The John Updike Society from the beginning, even to the extent of participating in the society’s conferences. And they’re supportive of the society’s efforts to restore The John Updike Childhood Home and turn it into a museum and literary center. —A large wooden chest that Updike described as having been in the upstairs hallway in the space where the hallway widened near the front of the house at 117 Philadelphia Ave. Donated by Miranda Updike. —The wooden headboard from the bed that, by Updike’s description in the short story “The Brown Chest,” used to be in the front guest bedroom in the Philadelphia Ave. house, the same room where Linda Updike had her typewriter and worked at her writing while young John, when he was home from school with an illness, would lie in that bed and watch her work. The moon and stars were painted together by Linda and John. Donated by Elizabeth Updike, who says the rest of the bed is coming. —Two companion “moon” chairs, one of them still painted and the other stripped by Linda. Donated by Michael Updike. —A rocking chair that came out of the Plowville house and likely also was the chair that John Hoyer used to sit in downstairs in the living room, which the family also called the “piano room.” Donated by Miranda. 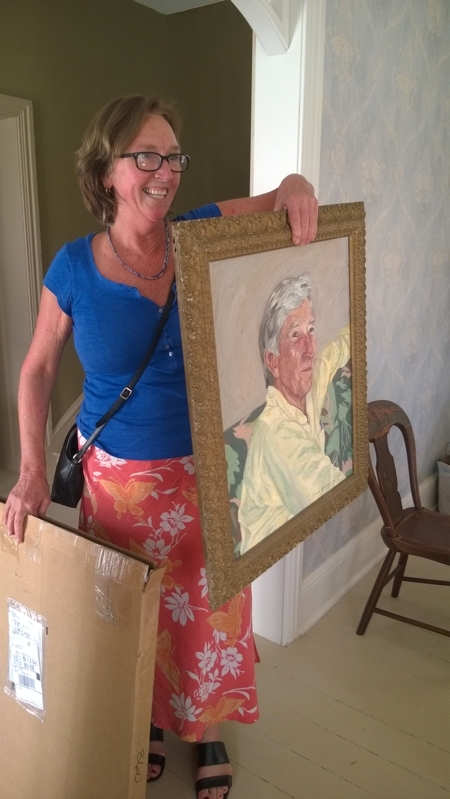 —A portrait of John Updike painted by Edward Hemingway, Ernest’s Grandson, as the prize when Updike went to Key West to accept the Conch Republic Prize for Literature. He posed for the painting in a suite at the Ocean Key House while talking with young Hemingway and James Plath, who was then director of the Hemingway Days Writers’ Workshop & Conference. Donated by Elizabeth, David, Michael, and Miranda. children’s mother and Updike’s first wife. 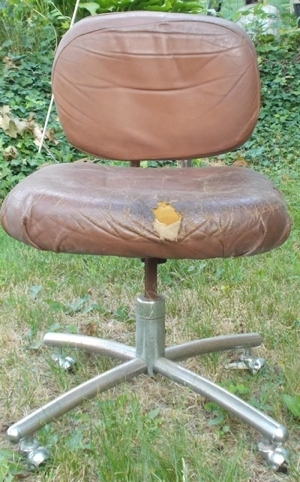 —Updike’s writing chair, used until he was 70 and encouraged to switch to a new one. Donated by Miranda Updike. —Half of a Mickey Finn comic by Lank Leonary that young Updike had on the wall of his room when he lived in the Shillington house. Donated by Elizabeth Updike Cobblah, David, Michael, and Miranda Updike. —An American Academy of Arts and letters cloth hat, the same one described in the essay “A Desert Encounter.” Donated by Michael Updike. 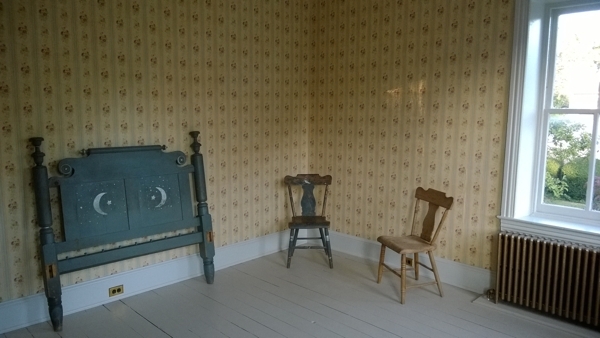 —A corner cupboard that came out of the Plowville house and, again, likely the Shillington house as well. When Updike lived in Georgetown he tried to move the two-piece cupboard by himself and the top section fell on him, breaking all but one pane of glass. Donated by Miranda Updike. —A drop-leaf kitchen table that came out of the Plowville house and also quite probably the Shillington house. Donated by Miranda Updike. 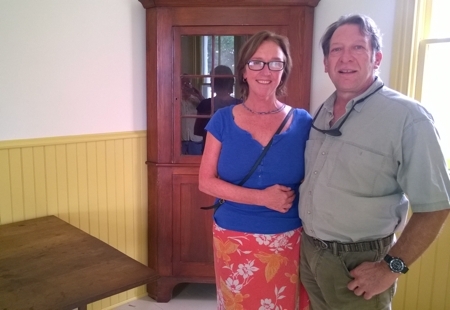 The society is grateful to the family for donating these treasures for the house museum, and appreciates as well the work it took for Miranda and her boyfriend, Jeffrey Kern, to haul the items down and move them into the house. It was the first time that Miranda, who represents the family on the board of The John Updike Childhood Home, had seen the house. Though the children visited their grandparents at the Plowville farmhouse, other people were living in the Shillington house at the time. Given the recent restoration, Plath told her that she is the first in the family to see the house as it would have looked when her father, his parents, and his maternal grandparents lived there during the ’30s and early ’40s. This entry was posted in Acquisitions, Donors. Bookmark the permalink.